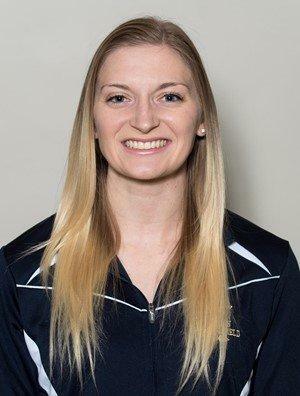 EDINBORO — Clarion senior Jessica Shomo (Clearfield) broke her own school record by sprinting 60 meters in 7.86 seconds for a third-place finish in the Edinboro Invitational in the Mike S. Zafirovski Sports and Recreation Dome Friday afternoon. Shomo, whose previous best was 7.87 seconds on the same track last year, also qualified for the Pennsylvania State Athletic Conference Indoor Championships booked for the same venue Friday and Saturday with the eighth-fastest dash in the conference this season. She added a fourth-place finish in the long jump with a leap of 4.84 meters (15 feet, 10½ inches). BRADFORD — Freshman Cody Spaid (Clearfield) capped an outstanding rookie season for Pitt-Greensburg with seven points and a game-high 10 rebounds in a 72-49 Allegheny Mountain Collegiate Conference loss to Pitt-Bradford Saturday afternoon. Spaid, who also blocked one shot, had only two points and, for the first time in 25 games, no rebounds Wednesday night when the Bobcats (1-24, 1-17 AMCC) fell 83-56 to visiting La Roche. The 6-7 forward made 14 starts, including the last 10 games, and enjoyed his best game in Pitt-Greensburg’s lone win at Mount Aloysius with 11 points, 20 rebounds, two assists, one steal and four blocked shots in 35 minutes. The rebound and block shot totals are tied for fifth on the school’s list for individual game records. Spaid wound up the No. 1 rebounder for the Bobcats with 140, a 5.6 average, also topped them in shooting averages in all three categories, making 66 of 128 field goals (.516), 10 of 25 three-pointers (.400) and 29 of 43 free throws (.674). His 171 points (6.8 ppg) were fourth while his 20 assists and 20 steals were third on the team, which will return all but one of its players next season. Spaid, who averaged 18 minutes per game, also recorded 11 steals. CLARION — Redshirt senior 149-pounder Jake Keller (Curwensville) lost by decision in his final dual meet in Waldo S. Tippin Gymnasium for Clarion Sunday afternoon. West Virginia spoiled Senior Day for the Golden Eagles, winning the non-league match 24-10. Keller was defeated, 10-3, by Christian Monserrat, who built a 10-1 lead with eight points in the second period. The Mountaineer lost the major decision bonus point when Keller reversed in the third period. Keller finished 5-7 in duals and will go into the Eastern Wrestling League Championships at Bloomsburg March 4 with a 5-9 record. FORT PIERCE, Fla. — Sophomore outfielder/pitcher Thomas Summers (Clearfield) doubled his hit total with three singles and a double in four games as the designated hitter for Indian River (Fla.) State College last week. He had his first two-hit game for the Pioneers with a single and double in a 6-5 win that gave the Pioneers (5-9) a split with visiting Santa Fe College Saturday. Summers added 49 points to his batting average (.174). He has driven in one run. The left-hander has pitched one scoreless inning. MYRTLE BEACH, S.C. — Junior pitcher/first baseman Rachel Hoffman (Clearfield) was tagged with the losses in both of her starts as Clarion got off to a rocky start in the Snowbird Freeze-Out, managing only 14 hits in five setbacks, four by shutouts. Hoffman received no run support in her five-inning outings against Molloy (N.Y.) in a 7-0 loss at the Ned Donkle Complex Friday and once-beaten New Haven (Conn.) in a 6-0 defeat at the Grand Park Rec Complex Sunday. She struck out one batter and walked three in both games while allowing 16 hits and 12 runs, 11 earned. Hoffman had one hit in five plate appearances in three games. Last year, she logged two of the Golden Eagles’ four wins in her 15 decisions, working 86 innings with a 6.84 earned run average and had 19 appearances, seven complete games and 56 strikeouts, all team highs. She gave up 115 hits and 105 runs, issued 44 walks and hit eight batters. At the plate, Hoffman hit .250, going 22-for-88 with a team-high eight doubles, one triple and seven runs batted in for 35 games, all but one as the starting pitcher, first baseman or designated player. Hoffman began her career at Pitt-Johnstown and was 4-13 with a 6.36 ERA in 19 games, including 17 starts with 11 complete games. She pitched 88 innings with 32 strikeouts, 38 walks and nine hit batsmen while surrendering 136 hits and 95 runs. Her batting average in 31 games for the Mountain Cats was .211 with one double, one triple and one home run among her 15 hits. She drove in five runs.